Creating your own kitchen herb garden is one of the most enjoyable & rewarding activities for gardeners and aspiring chefs alike. Simply everyone who enjoys cooking will appreciate having a consistent source of fresh culinary herbs available to enjoy. Even if you are not an avid cook, the delightful aroma of fresh herbs coming from your herb garden will bring joy to anyone who happens to walk by. Have you always wanted to grow your own herbs, but were afraid it would be too much maintenance? The nice thing about growing herbs is they are incredibly easy to take care of. Once you have established your herb plants in your garden or pots, they will grow quite happily with just a minimum amount of care. 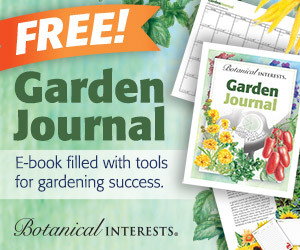 The kitchen herb garden is an excellent way for beginners to get started in gardening. And you don’t need to be a master chef to use fresh herbs in your cooking. Once you know the basics, you can incorporate them into almost any meal. Even just adding a sprig of curly parsley to the plate, can jazz up an ordinary looking chicken dinner. So why not get started & create your own culinary herb garden today? This is the most important decision by far. You will want to place your herb garden near your kitchen. You will be much more likely to use the herbs if they are within easy reach. If you have to truck out to the far end of the yard, you will not enjoy them nearly as often, and they may get neglected. If you simply don’t have a sunny spot close to the house, you can still have a successful kitchen herb garden. You can grow herbs indoors by setting up a grow room or purchasing a little hydroponic system for your countertop. You can also create a larger plot in the backyard, then bring fresh bunches indoors, to keep on the windowsill so you will still have easy access to them during cooking. Don’t think you have to limit yourself to a single location. You can keep a few pots of parsley & thyme on the porch, then have bunches more growing in your backyard herb garden. 2. Provide Enough Sunlight For Your Herb Garden. Almost all culinary herbs are sun lovers. If you want to grow herbs outdoors, select a location that receives at least 6-8 hours of sun light a day. Think about how this location is at different times of the year. If it’s early spring when you are looking at the location & the trees have not fully filled in, your sunny corner may end up being quite shady come summer. If you are growing your own herbs indoors, an ideal location would be a southern facing window or even better a sunroom which has larger areas for the sun to come in & reach your plants. If you don’t have the perfect location indoors, don’t worry, you can always add supplemental fixtures so your herbs will get enough light. 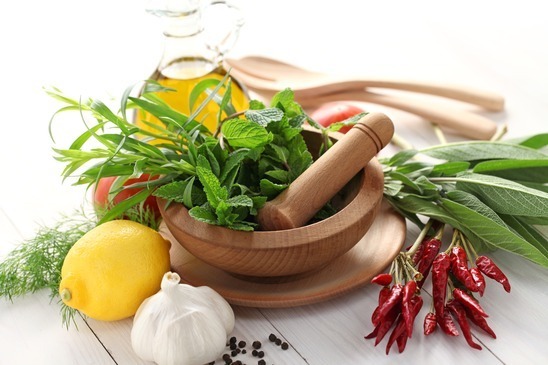 Take some time to consider the different herbs and flavors you enjoy in your daily cooking. Here are a few ideas to get you started. If you enjoy Italian Foods, grow Basil, Oregano & Parsley. If French Flavors are a Favorite, include Tarragon, Chives, Parsley & Chervil. Are you a Meat Lover? Thyme & Rosemary are a must have. Soups & Stews would not taste the same without Parsley and Thyme. If you are Vegetarian, you can’t go wrong with Parsley, Thyme & Rosemary. For spicing up Salads & Eggs, give Cilantro, Chives or Chervil a try. If you enjoy Seafood & Fish, grow plenty of Basil, Dill & Chives. Don’t think you have to decide it all right away. You can always pick a couple herbs to start with, then expand your garden once you know what is working in your home. 4. Plan Ahead So You Get The Right Materials. Potting Mix or Soil. There are different types of potting soils and mixes depending on whether you are growing herbs indoors, in pots or in the ground. Potting Mixes are normally lighter and provide better aeration which is better for indoor plants and containers. Choosing a good potting mix is especially important when growing herbs in pots. A few good choices recommended by the Colorado State University are: Black Gold All Purpose Mix, Fertilome Potting Mix or Nature’s Yield Potting Soil. Potting soil is best used outside and most often mixed 50/50 with your native garden soil. If you are unsure, don’t be afraid to ask the folks at the garden center. They will almost always be happy to help you and can advise you which product would be most suited to your specific application. Herb Pots, Planters or Containers. You will want to think about the types of herbs you are planning to grow in your kitchen herb garden & make sure to get a pot or planter that is the right size. There are some herbs like parsley or basil which have long roots & require a deeper container. If you are growing herbs in pots indoors, you can select pots that are on the smaller side. However, if you plan on creating an outdoor container herb garden, you will want to choose larger containers or planters. If you are growing several herbs together in one pot, you need to take into consideration the mature size of each plant – bigger is almost always better if you are unsure. You will be surprised how quickly herbs grow when given the right environment. For more tips on growing herbs in pots, be sure to read the article – 6 Requirements to Successfully Growing Herbs in Pots. Herb Plants or Seeds. 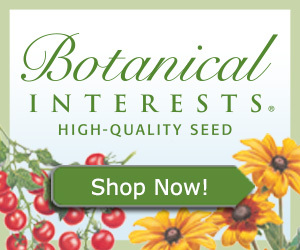 Depending on the time of year, you may be able to purchase young seedlings directly from a retailer or home improvement store. But, if you cannot find what you are looking for, the majority of herbs are easy to grow from seed. There are many different varieties of each culinary herb. For example there are dozens of basil varieties. Greek basil is a dwarf variety that is just 8 inches tall & well suited to indoor or container gardening. However sweet or Genovese basil can grow up to 3 feet tall. Make sure you know which variety you plan to grow before buying it to include in your kitchen herb garden. Every herb plant or seed package will give you the mature size of the plant, so just double check you are getting the right one. 5. Make Herb Gardening A Family Activity. Get the kids involved, let them help to dig the garden area or select the pots for your herbs. Get your families input when selecting the different types of culinary herbs you will be growing. Put little Susie in charge of picking the herbs for your supper. Maybe you have a relative that you know loves mint tea, consider growing a small patch for them, then bringing over fresh sprigs of mint when you visit. Herb gardening is an activity that can be shared by the whole family. Everybody may not like to garden, and it’s a good bet that everybody likes to eat! Why not get them involved & make the kitchen herb garden a place the whole family enjoys.